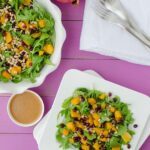 This Butternut Squash Salad is full of flavor and is also an easy way to increase your daily fiber intake thanks to the vegetables and beans. First of all, thanks for all the sweet well wishes over social media while I’m in the hospital! It means the world to me and helps so much to know that so many people are thinking positive thoughts for you! For those of you that don’t know, I’ve been in the hospital since Tuesday getting iv antibiotics for a breast abscess. I’m hoping to be heading home today if all goes well! Anyways, as usual I have wonderful friends willing to help me out with the blog while I’m dealing with life! Today it’s time to introduce you to another RD friend of mine. Alex is the amazing blogger behind the blog Delish Knowledge. She takes gorgeous photos and for those of you looking for more meatless meal ideas, you’ll definitely want to check out her blog! She has so many great vegetarian recipes! Today she’s sharing a yummy fall salad with you guys. Hi! I’m Alex over at Delish Knowledge and am so excited to be guest posting at the Lean Green Bean today! I’ve been a fan of Lindsay’s work for years; she is such an inspiration for leading a healthy and fit lifestyle. Seeing Lindsay’s instagramed Cross-fit workouts at 39 weeks pregnant was exactly the push I needed some days to get my own workout on. At Delish Knowledge, I focus on healthy, whole food recipes that don’t require a lot of cooking experience. As a Registered Dietitian, I find that most of my clients want to eat healthy but various excuses stand in their way. Time limitations and inability to cook usually top the list. I get it. Days that fly by too quickly and endless to-do lists can often trump even the best of intentions. That’s why I created my blog. It’s a place to show healthy recipes that taste good and don’t require an advanced cooking skill set. I also like to focus on un-dieting, taking the emphasis away from calories and fat grams, and putting it back on food satisfaction and nourishment. I find that when my clients restrict their caloric intake by reducing portion size or skipping snacks, they do okay for a while… until they don’t. Until they overeat at lunch one day and find that they can’t stop. Or they give up, because counting calories is too tedious and clients would rather feel liberated with food, not burdened. I understand all of these normal feelings associated with dieting and the best part is, there’s an easier way. Enter the principle of nutrient dense eating. Or, as I like to call it, “the biggest bang for your calorie buck”. Nutrient density examines the quantity of nutrients you receive from a food given the number of calories it contains. It’s a simple way to balance nutrients with calories. Simply stated, we should emphasize foods in our diet that are rich in vitamins, minerals, phytochemicals and antioxidants. Examples include fresh fruit, vegetables, and whole grains. The best part is that almost all foods can fit into this plan. Craving a bowl of fettuccini? Me too! Add in some nutrient dense vegetables and a side salad. You still get to enjoy the flavor, texture, and comfort of pasta while filling up on fiber & water-rich vegetables. 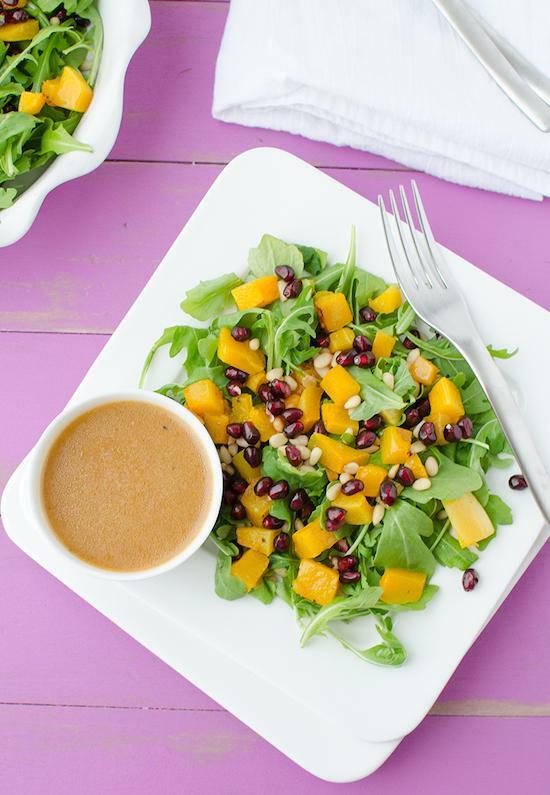 This Butternut and Arugula salad is the perfect example of a nutrient-dense meal. Just look at all those colors! Creamy vitamin A-packed butternut squash is roasted to perfection. To cut down on prep time, you can purchase butternut already peeled and cubed. While it tends to be a little more expensive than the whole squash, sometimes the extra dollar or two is worth it if it saves you from unwanted stress in the kitchen. Arugula is hands down my favorite winter salad ingredient. I cannot get enough of its peppery bite, and its heartiness prevents it from getting lost in the sea of other winter flavors. I used pomegranate seeds in this salad but if you don’t want to go through the prep work or cannot find the arils on their own, you can sub in dried cranberries or cherries. To make this lunch-time ready, I tend to prep all the ingredients ahead of time (on Sunday, right Lindsay?) to bring with me to work in small containers. Then, when I’m ready to eat, I pile them all in a large bowl, dress and toss! If I need a bit more, I will add in some additional protein. Canned white beans are an easy, no-fuss protein source that tastes great in this salad. Preheat oven to 400 degrees F. Toss cubed butternut squash with 1 tsp. olive oil and pinch of salt/pepper. Roast butternut squash for 40 minutes until soft and golden. Set aside. Heat a skillet over medium heat. Add the pine nuts and tossing often, toast until golden brown and fragrant, about 3-4 minutes. 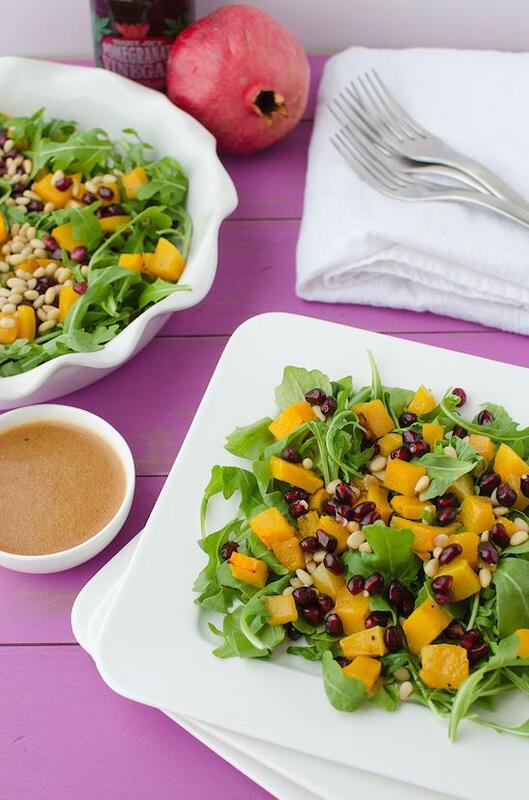 Toss together the arugula, pomegranate seeds, roasted butternut squash and pine nuts. Whisk together the pomegranate vinegar, maple syrup, garlic clove and pinch salt/pepper. Slowly whisk in the olive oil until an emulsion forms. To serve, divide salad into 4 bowls. Drizzle 1/3 cup of dressing and toss well. Use remaining dressing or save for later. Will keep for up to 1 week in the fridge. 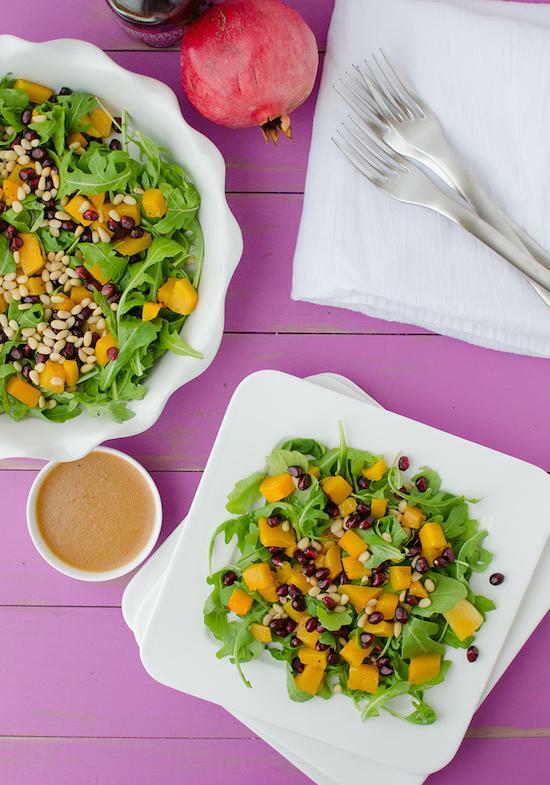 Check out this gorgeous, hearty salad from @delishknowledge and @leangrnbeanblog! I did not know that you were in the hospital you poor thing. That sounds super painful. Hope you feel better soon and get home to your little sweetie! And this salad looks lovely. I feel so clueless Lindsay. I hope you recover soon and that all is well. This salad looks amazing! So many good ingredients! still wishing you a speedy recovery! gorgeous salad! I had no idea!! Hope you feel better quick, no fun. This salad looks amazing!! So nice for you to share Alex, will check out your blog! Hope you do get released (healthy obviously) today Lindsay! Sorry to hear that! This does sound wonderful, and strangely enough, I actually made something very similar this week, with a few tweaks 🙂 Great minds think alike huh! Have a wonderful weekend to you both! I’ve been loving arugula lately. This looks fabulous and thanks for sharing. This is so light and fresh for the season! Hope you are feeling better, that’s so scary 🙁 Alex always has the best vegan recipes and this salad also sounds delish! Yumm! So fresh and simple. Pine nut fanaitic here. Looks so yummy! I don’t think you can go wrong with these ingredients. I love arugula salads. I had no idea – hope you are home now! Thanks for the salad recipe. I love arugula. Oh no–I didn’t know! So sorry. I’m sure this has been a tough time for you. I hope you are home today! Butternut squash is amazing in salads! It is my favorite salad topper during the Fall/Winter. Lindsay, I really hope you feel better!!! Fingers crossed! Hi Alex!! Yay! I love this post and recipe. So glad to see you on TLGB. Nice work!! Argh, hope things are going well buddy- Thinking of you!